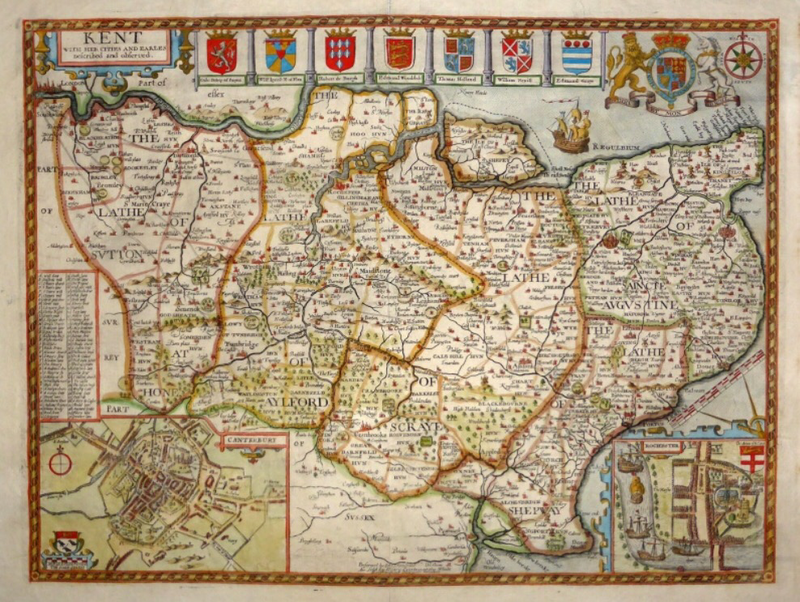 along with their constituent “Hundreds”, this function had been lost by the nineteenth century but the Lathes were never formally abolished and indeed Shepway re-emerged as an administrative unit on 1 April 1974, until it was renamed, on January 18th 2018.
itself reflecting the various depictions of the horse found around the county on plaques and signs and the county arms that adorn the Kent County Council building in Maidstone. 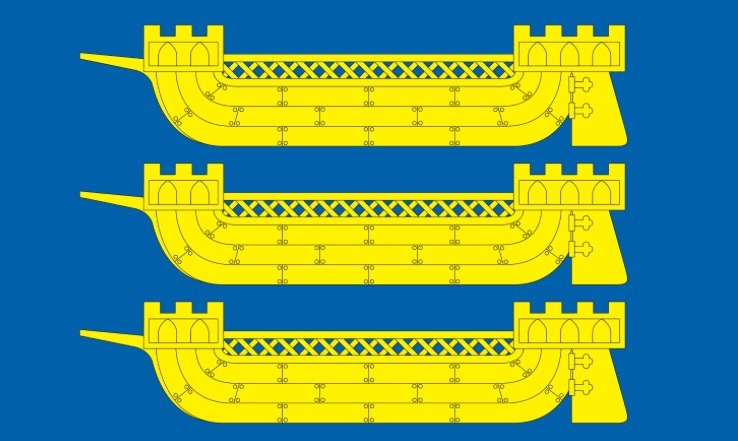 Thus the flag of the Lathe of Shepway features a golden Cinque Ports ship. This both recalls the heritage of the local confederation and also emphasises the strong association of the locality with the sea, whose colour forms the background against which the ship is placed. The blue is a lighter shade to enhance the contrast with the red of Kent in the hoist panel. for the ‘community’ of towns which are members of the Cinque Ports. The arms of the Cinque Ports and the armorial banner formed from it, belong to the local authorities of the member towns of the Cinque Port towns and may be lawfully displayed only by these bodies and the Confederation, as their representative body. However, the Confederation wished to offer an option for residents of the Cinque Ports towns to demonstrate their affinity with the body. The community flag, which greatly resembles the flag of Shepway, maintains the traditional banner as a basis, thus keeping a direct and clear link between the community and authority. The Lathe Of Saint Augustine. the first Archbishop of Canterbury, the main city in the lathe. This form of cross is known as “The Canterbury Cross” after a Saxon brooch, dating around 850, that was found in Canterbury in 1867. 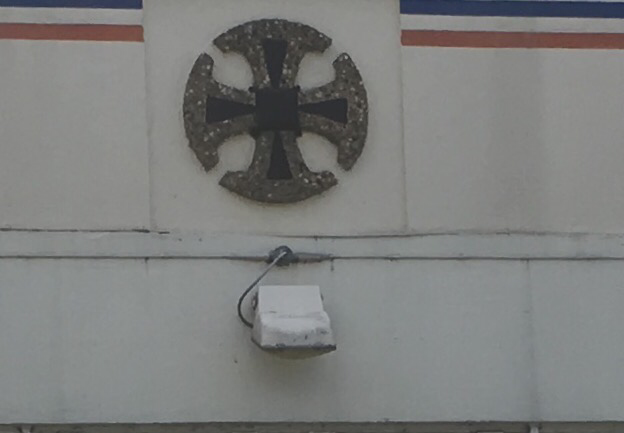 Appropriately, a Canterbury Cross, is a decorative feature on the ‘Kent and Canterbury Hospital’, in Canterbury! are sold at the souvenir shop there. which contrasts well with both the main charge and the red hoist panel. The combination of these two devices, using a distinctive green and white colour scheme that reflects the colours of both original emblems, thus symbolises the combined localities that make the Lathe of Scray. a copper alloy funerary device used in a cremation ceremony and discovered in 1886 in an ancient burial ground in the territory. It is identified with the Celtic Cantii people, after whom the county of Kent is named. The artefact is dated to approximately 75 BC. The distinct decorative handle on the bucket, depicting a human face and named for the lathe in which it was discovered, is an ideal local symbol for deployment on a flag for the Lathe of Aylesford. The device is set against a grey coloured field, suggestive of the earth from which it was retrieved. and the local football club. The cross is also present on the civic arms of Dartford, on the necks of the two supporters bearing the shield, where it is white against a red and black field. and this is the colour scheme utilised for the lathe flag, which is seen as particularly dramatic and distinctive.